Order within 3 hours and 8 minutes to receive your order by Monday 22nd April. This white gold diamond cluster ring is the ultimate bloom of diamonds. The ring looks sensational on the hand when worn with the light capturing every facet and making the ring burst with glistening character. The ring has been flawlessly crafted out of 18 carat white gold to form the twisting structure of the ring. The half plain gold shank hugs the back of the finger as it moves around the meet the diamond set shoulders. Each of the shoulders have been set with individual brilliant cut diamonds which twist up into the main setting of the ring making it completely fluent. The shoulders loop around the two individual central diamonds which are subtly held by three claw settings. 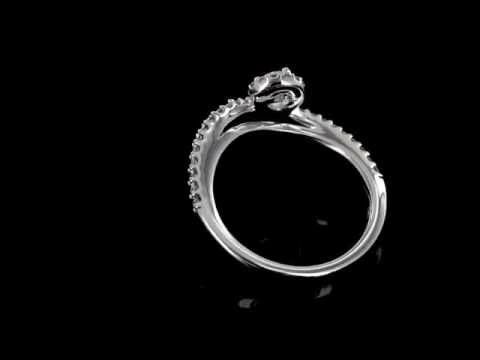 This white gold diamond twist ring has the complete 'wow' factor and is a pleasure to wear. Ring size M. The ring can be altered, please state size required when ordering.